We would like to present a unique case of a 3-year-old child who presented to our hospital with 15 days complaint of unsteadiness of gait and frequent falls, not associated with fever. On examination, there was gait ataxia otherwise no other significant clinical findings were present. All routine blood investigations were normal. MRI was done [Figure 1] which showed hyperintense right cerebellum with enlargement. Structural architecture of cerebellar folia were well preserved. Vermis was slightly more prominent with more hyperintense signal changes. Post contrast there was no contrast enhancement. Depending on these findings, possibility of Lhermitte-Duclos disease More Details (LDD) was considered and patient was asked to come for follow-up after 1 month. After 1 month there was minimal worsening in gait associated with vomiting and headache. Repeat CT scan and MRI were done [Figure 2]. This time imaging findings showed increase in size of vermis with bright signal changes without significant contrast enhancement. There was mild development of hydrocephalus due to mass effect on 4 th ventricle by the vermis. MR spectroscopy was done which showed elevated choline and reduced NAA from vermis. This time due to mild increase in size of vermis and spectroscopic findings, possibility of medulloblastoma was considered and patient was taken for decompressive surgery. Histopathological report showed medulloblastoma with infiltration into the cerebellum. Our case is unique in few aspects. Medulloblastoma mimicking LDD in children is extremely rare. Medulloblastoma infiltrating hemicerebellum along with vermis without contrast enhancement and not showing restricted diffusion as in our case is also rare and not described. Only spectroscopy could suggest possibility of tumor in our case. Thus, we suggest that any case mimicking LDD should be studied with spectroscopy along with other imaging features and follow-up scans for early diagnosis and prompt treatment. 1. Perez-Nunez A, Lagares A, Benitez J, Urioste M, Lobato RD, Ricoy JR, et al. Lhermitte-Duclos disease and Cowden disease: Clinical and genetic study in five patients with Lhermitte-Duclos disease and literature review. Acta Neurochir (Wien) 2004;146:679-90. 2. 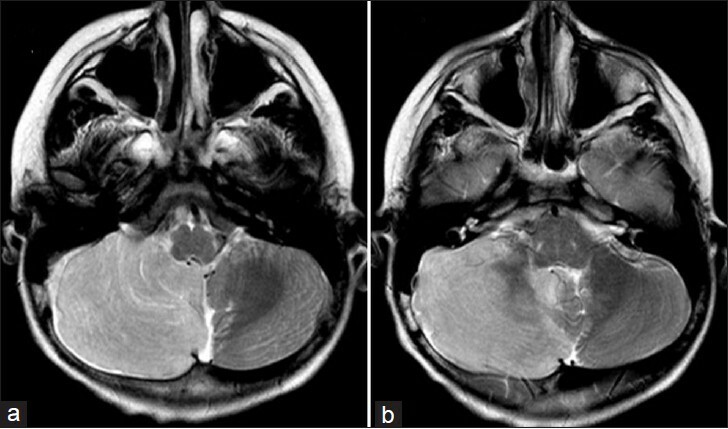 Bayat MR, Sarawan J. CT and MRI findings in Lhermitte Duclos disease. S Afr J Radiol 2005;9:30-1. 3. De Mendonca JL, Barbosa H, Viana SL, Freitas FM, Viana MA, Ferreira AC. Pseudotumoural hemicerebellitis: Imaging findings in two cases. Br J Radiol 2005;78:1042-6. 4. 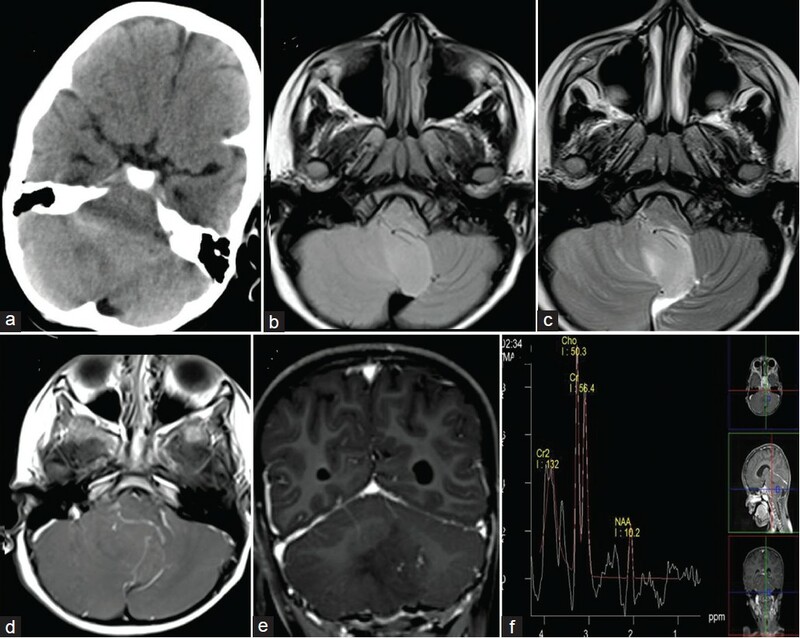 Mittal P, Gupta K, Saggar K, Kaur S. Adult medulloblastoma mimicking Lhermitte-Duclos disease: Can diffusion weighted imaging help? Neurol India 2009;57:203-5.